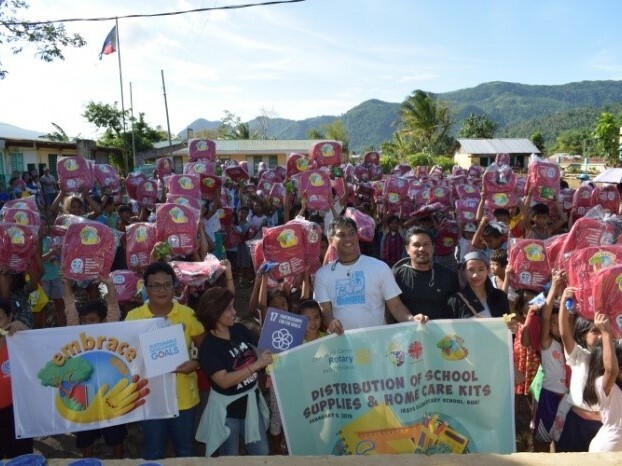 New School Bags for Iraya Elementary Pupils – Jaime V. Ongpin Foundation, Inc.
Pupils of Iraya Elementary School were provided new school bags as EMBRACE reached out to them last February 6, 2019. Located in Barangay Iraya in the town of Buhi, Camarines Sur, one of the areas struck by typhoon Usman last December 2018, the school can be reached by crossing the Buhi Lake for 30 minutes and walking about 20 minutes from the dock. Due to the flood and landslide brought by the heavy rains, some of the houses and agricultural lands were destroyed. As the flood rose, it reached the school’s classrooms and got the school files and furniture all wet. It was hard for the residents to rise up again although the government and other organizations rendered relief goods for their basic needs. EMBRACE, on the other hand, saw the need of the school children; thus, it provided them school bags. Before the distribution begun, a short program was prepared by the teachers. The children patiently stood on the muddy ground from the start until the end. EMBRACE, Jaime V. Ongpin Foundation, Inc. (JVOFI) and the project partners (Caritas Caceres (Naga) and Rotary Club of Pili) were acknowledged by the teacher who stood as the master of ceremony. This was followed by messages from the PTA president and the school principal. They expressed how grateful they were for the assistance provided to their children, and encouraged the pupils to be grateful as well. Rev. Fr. Marcel Emmanuel DP. Real, Executive Director of Caritas Caceres (Naga), emphasized that despite what happened to their place, they should be thankful to the Lord because they survived the disaster. After the messages, the distribution followed. The children received their new bags with happiness and excitement. Snacks for the children, food packs and water jugs filled with water were likewise provided by the project partner.